Arsenal slide into the international break with a tricky home fixture against Brighton, tricky in that they will have just sent 18 players to Belarus three days prior. Of course, many first team regulars were left behind in London, so Arsenal will hope that they can pick up full points despite the club's travels and enter the oncoming break by extending their winning streak to four and their unbeaten run to seven, across all competitions. It's "as you were" with the injury list, though without rotation for this match, there's even less to talk about now as there was on Thursday. Arsenal made nine changes to the side that beat West Brom before the trip to Belarus, retaining only Shkodran Mustafi and Mohamed Elneny. Mesut Özil has not started a match since the Bournemouth victory due to injury. If he comes back to the XI here, then Aaron Ramsey will slide back in the formation and Elneny most likely drops. Predicted XI: Čech, Mustafi, Koscielny, Monreal, Bellerín, Kolašinac, Xhaka, Ramsey, Özil, Alexis, Lacazette. Glenn Murray has returned to first team training after an ankle ligament injury. However, Tomer Hemed will serve the first match of a three-match ban after he was seen on video review to stomp on DeAndre Yedlin. Match officials missed the incident at the time. Hemed had the only goal in Brighton's 1-0 win. Beram Kayal, out with a leg injury, is hopeful of getting a run out with the Under-23's soon, but he's short of fitness for this one. Kayal suffered a leg break in Brighton's final pre-season friendly. Steve Sidwell (remember him?) is out until possibly November with a lower back injury. Sam Baldock won't be back until after the international break. His timetable was described as a month back on September 14. Predicted XI: Ryan, Bruno, Dunk, Duffy, Suttner, Knockaert, Stephens, Pröpper, March, Groß, Brown. Arsenal have not yielded a league goal since they forgot they had to play Liverpool back on August 27. They have now kept Premier League clean sheets against Bournemouth, Chelsea, and West Bromwich Albion. Arsenal's only goals allowed during their current unbeaten run, which now stands at six, have come in Europe. Brighton did not start off life in the Premier League on the right foot, losing their opening fixtures to Manchester City and Leicester. They've cobbled together seven points since then, with a draw at Watford and wins over West Brom and Newcastle. Those seven points are good for 13th in the table. They did, however, lose at Bournemouth twice in five days, first in the league and then later in the League Cup. Brighton's most recent season in the top flight, prior to this one, was 1982/83. Brighton won their match at home, 1-0, but lost 3-1 at Highbury in February of 1983. 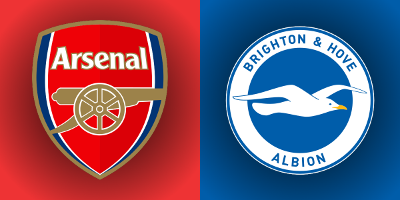 Arsenal and Brighton have met in three FA Cup ties since then, all of which were played in Brighton. In 1988, Arsenal were 2-1 winners. In 2013, Olivier Giroud scored twice and Theo Walcott had a late winner, as Arsenal won 3-2. In 2015, Walcott, Mesut Özil, and Tomáš Rosický scored, as Arsenal were again 3-2 winners. I haven't made the "more like Kevin Enemy, amirite?" joke in a while, so I figured I'd just slip that in there. Arsenal won two and lost one with Friend last year, though the loss was a League Cup tie against Southampton. The first win came 3-1 at Watford early in the season; the second was the 5-0 win at Southampton in the FA Cup. Brighton had Friend very recently (10 days ago to the date of this preview, in fact.) Friend took charge of their aforementioned League Cup loss at Bournemouth, which came in extra time.